A new WHO report links air pollution to roughly one in eight deaths globally. 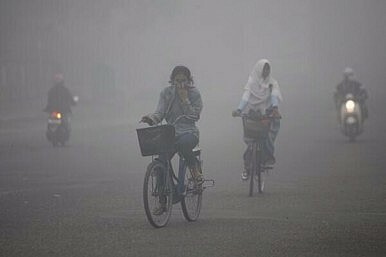 As forest fires rage in Indonesia, blanketing the region in a thick haze and triggering respiratory problems in more than 30,000 people, a new report from the World Health Organization blamed seven million global deaths in 2012 on poor air quality – more than AIDS, diabetes and road injuries combined. The latest findings trump a report published last summer by the U.S. Environmental Protection Agency and NASA that put the figure at approximately two million. The UN health agency listed Southeast Asia (including Indonesia and India) and the Western Pacific (China, Japan, South Korea and the Philippines) as the most severely affected regions, accounting for 5.9 million of the total deaths. Doctors drew a direct link between air pollution and some of human kind’s most frequent killers: heart disease, stroke, pulmonary disease and lung cancer. “Air pollution, and we’re talking about both indoors and outdoors, is now the biggest environmental health problem, and it’s affecting everyone, both developed and developing countries,” Maria Neira, the World Health Organization’s public and environmental health chief, told AFP. Outdoor pollution, like the smog spewing out of Sumatra, was linked to 3.7 million deaths, 80 percent of which were caused by heart disease and stroke. Indoor air pollution, such as the smoke caused by coal and wood fires, killed an additional 4.3 million people. The most recent figures provide a stark contrast to previous WHO reports. The group’s 2008 figures put total international loss of life due to poor air quality at 3.2 million, with 1.3 million attributed to outdoor pollutants and 1.9 million attributed to indoor pollutants. The figure is likely to continue rising, particularly in Southeast Asia, due in large part to global demand for palm oil, used in everything from cookies to shampoo. Satellite mapping has pinpointed more than 3,000 fires burning across Indonesia, concentrated in Riau province. Riau, located in northern Sumatra, is the epicenter of the country’s palm oil trade. Rainforests are slashed and burned to make room for an increasing number of plantations, at the expense of endangered wildlife and the health of Indonesian citizens and those in neighboring countries. Plans to extinguish the fires via specialized aircraft have been thwarted, not surprisingly, by low visibility. “Few risks have a greater impact on global health today than air pollution; the evidence signals the need for concerted action to clean up the air we all breathe,” Neira added. Groups in Malaysia are helping educate farmers on sustainable practices for producing the lucrative palm oil.